Mister Ron Scott, and anyone else with information on this subject. I am curious about forester jobs in Michigan and surrounding areas mostly based on the fact that I grew up in the midwest and I would be happy to move closer to my parents. I recently vacationed in the Traverse City area and noticed that there is definitely forest management going on in the area on the private side. I believe that there is a professional qualification for foresters in Michigan now (correct me if I am wrong), but I am having a hard time figuring out what getting that would entail. I am a Registered Professional Forester in CA if that has any transferability to the midwest, especially Michigan. Entertain me on why this is a good or bad idea to consider, and if there are even jobs to get that would be at least a somewhat lateral move (cost of living figured in). Obviously I would have some locality learning curve to tackle. I don't imagine that would be a problem after dealing with CA's rules and regulations. 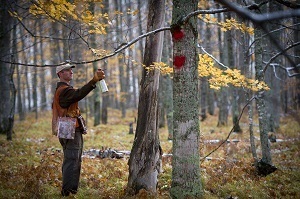 Yes, there is a professional qualification for foresters in Michigan. As a minimum you need to be a graduate of a 4 year forestry school certified by the Society of American Foresters (SAF). Michigan is currently revising or updating its forester registration to a licensing requirement. It pretty much follows the requirements of the SAF Forester Certification. Become a member of the Consulting Foresters of America, Inc.
the U.S. Forest Service, State DNR's, Private industries, Consulting Forester Companies, etc. The more experience that you have, the easier it is for you to become established. Thankyou for the reply Ron. I was a member of SAF for a few years, but stopped renewing because they seem to focus on eastern issues almost exclusively. Maybe I should pick that back up. As far as the new licensing requirements go, I have not been able to determine much. Where would I find actual state law governing Mich Forestry rules. I know the USFS doesn't use state law here in CA, so that is no doubt the same there. My question I guess is, I have a professional license in CA, and graduated from an SAF accredited school. Is that transferable to Mich requirements or would I have to take another exam? Pass SAF magazine tests for points? The Lara application requires you to list the county you have worked. Would that make an out of state guy come work just to have a county to list? Sorry if I ramble on, and thanks for the information. Your training and background as a professional forester graduating with a 4 year degree and working at least 5 years under a professional forester would pretty much be transferable to Michigan. The more you become known in Michigan forestry circles the easier it is to find work as a forester. Thank you for the response Ron. That was my take as best as I could tell. I just figured I would ask given I knew there were some folks that post that are in the area. A job in Michigan would be pretty cool if I could get one, because it would get me back closer to home. The Presque Isle and Cheboygan Conservation Districts (CD) are seeking a Forestry Assistance Program (FAP) District Forester. This position provides private landowners with technical information regarding forestry, wildlife habitat, and related natural resource concerns so that they may make informed decisions about the use and management of their forestlands. The Presque Isle CD will be the employer of record with day to day administrative supervision provided by the District Manager and annual position activities guided by the FAP Advisory Team. Primary office space for the District Forester is located at the Presque Isle CD office in Rogers City, MI. This position requires a minimum of a B.S. in Forestry. This is a state-grant funded position that is renewed annually. Application Deadline: Will remain open until filled. Please send your cover letter and resume to presqueisle.cd@gmail.com or mail them to: Presque Isle Conservation District, 658 S. Bradley Hwy., Rogers City, MI 49779. Ron, thank you for posting all of these opportunities.It really is helpful to have someone that is so informed about the area. I hope to get there someday soon. The Forestry Assistance Program provides private landowners with technical assistance and information regarding forestry, wildlife habitat, and related natural resource concerns, so that they may make informed decisions and implement sound strategies regarding the use and management of their forestlands. Primary office space for the Forestry position is located at the Oceana Conservation District office in Shelby, Michigan. The service area includes Oceana, Muskegon and Newaygo counties. A degree in forestry is required for this position. Target start date is 1 October 2018. See attached or visit our website to see a full job description and information on how to apply. MAT is looking to hire an executive director, Newberry. The Chippewa Luce Mackinac Conservation District (CLMCD) is seeking enthusiastic applicants to serve as an educational Forester in the area of private lands forestry for the Michigan Forestry Assistance Program (FAP). The purpose of the Forestry Assistance Program is to provide private landowners with technical assistance regarding forestry, wildlife habitat, and related natural resource concerns, so that they may make informed decisions about the use and management of their forestlands. The candidate will be based in Sault Ste. Marie, Michigan and will include assignments in all of Chippewa, Luce, and Mackinac counties. Duties will be performed under the direction of the CLMCD Executive Director with yearly goals guided by an advisory board made up of directors and staff from the Conservation District, local, state, and federal partners. Office to field split is approximately 60/40 depending on the time of year. Application Deadline: 4:00pm EST, Monday, 19 February 2019. Interested applicants should send a professional resume, cover letter, and a list of three (3) references to clmcd@macd.org with the subject: Forester Position or mail to CLMCD C/O Mike McCarthy, 2847 Ashmun Street, Sault Ste. Marie, MI 49783 for consideration. Position will remain open until filled. The Michigan Department of Natural Resources is currently recruiting a limited term Forest Management Specialist 13 (Forest Planning and Modeling Specialist) in the Forest Resources Division. This position is located in Lansing, Michigan. The position is open to all applicants. Interested applicants must apply through NEOGOV. If you are interested in obtaining more information or applying for this position, click on the link below. Huron Pines is hiring for two positions. One is a Land Protection Director and the other is for a Conservation Stewardship Coordinator. The second will focus on implementing habitat restoration projects, developing school forest plans, and working with private landowners to more actively manage lands. HP would love to have someone with forestry and GIS skills for either position.